A Ghamgosar, Managing Director of Saipa Diesel Co.
Events- To what extent can Saipa Diesel play a role in the development of the new Silk Road? Alireza Ghamgosar- Iran, is one of the pioneers of international transportation activities, as the first caravan route that ran from the East to the West, from China to Rome, the first ancient corridor of the world, under the title of Silk Road, ran through Iran and was initiated by Iranians, through Iranian talent and genius. 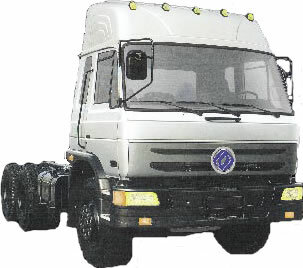 Saipa Diesel Co, as one of the most significant suppliers of vehicles for the country's transportation system has made an effort to produce trucks according to the highest world standards using the best modern technology, towards the renewal and continuation of this historic road and the promotion of the economic aims of Iran and of the world economy, through it. E- How can the slogan "national dignity, or national authority" be applied to your company? Extending after-sales services, beyond customer expectations: these services, provided through Rena Co, achieved the first rank in the country in 2004. E- How much of your products can you export considering your local demand? And to which countries do you export presently, if any? AG- During the recent years the company has exported spare parts and finished products to many countries such as Italy, United Arab Emirates, Syria, Kuwait, Ethiopia, Yemen, Turkmenistan, Iraq and Qatar. Now the production capacity of this company has reached the level of 100 trucks per day. In addition to its local annual production plan, Saipa Diesel plans to meet the demands of the regional markets and expand exports by up to 400 trucks through the implementation of new development projects. E- What facilities can you offer to local and foreign clients? AG- Saipa Diesel Co has offered its products and has also extended facilities to real and legal clients in the local market. The latest facilities which have been published in the local large scale circulation newspapers are as given in the table. This company also provides foreign markets with especial facilities in the form of long-term credits. E- What will happen if foreign automotive products enter our market? Changing some of the purchasing sources of the company from Euros to Dollars. For the year 1384 (2005-06) the Company intends to provide a number of vehicles of more attractive prices in addition to the 15,000 trucks produced according to normal production program. This is an undertaking that Saipa Diesel has accepted with the support of Road Transport Organization of Iran. These extra vehicles embrace a wide range of types of trucks for different uses as required by the country. A contract has been signed with China to import 6,000 units in three types of vehicles: ordinary trucks, compressor trucks and trailer trucks, all fully equipped with cabins, hydraulic systems etc using Japanese Nissan Diesel technology. These trucks all use Cummins engines with turbo chargers, intercoolers, DF gearboxes, coolers, radios etc. They are all up to Euro 2 standards and consume about 30 liters of fuel per 100 kilometers, and are capable of carrying 15 tons of cargo.